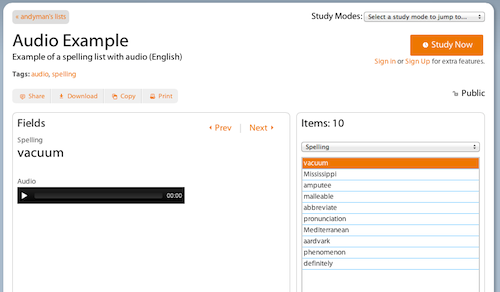 Headmagnet now allows you to create flashcards with audio/sound fields, in addition to text and image fields. You can now upload MP3, WAV, OGG, M4A and MP4 audio files. Use it to practice spelling, identify bird calls, or practice a foreign language. Here is an example list with audio. In a study list, click "+ New Item" to start adding a new item. In the item, click the "Add New Field". Enter in the name for the field (ex: "Sound") and set the field type to "Audio" and then click "Add" to finish adding the new field. You can now upload an audio file into that field. The audio file should be an MP3, WAV, OGG, M4A and MP4, and be under 2 MB in size. If it is longer than 10 seconds in length, then it will be clipped to the first 10 seconds. Click Save and Add Another or Save to upload it. Depending on your internet connection and the size of the file, it may take a few seconds for it to be uploaded. Do not leave the page until the file is done uploading. You can configure the options for presenting the audio field as a cue or a response in the mode options page.